When we think of work, no matter what the setting is, we almost always think in terms of tasks, projects, and deliverables. Regardless of industry, size of business, or location; when sourcing and hiring new employees, designing a talent retention strategy, or dealing with the day-to-day matters at the workplace, the focus is always on the inputs and outputs. How do we get from point A to point Z? How do we complete project X in less time? How do we make more profit? How do we push for more sales per employee? Certainly, the business goals and objectives are always the primary guiding principles for enhancing productivity and staying on track. The company’s mission, vision, and values should also formulate the overall direction and strategy for success. But what is equally valuable and often neglected is the relationships that are being constructed at every level and every business operation. Whether between managers and employees, between members of a single team or a department, or among different units in the company; relationships seem to be a topic that is shied away from, and often considered less of a priority. Healthy and productive relationships at the workplace can make a tremendous difference for any business. Think of disgruntled employees who are very happy to bad-mouth your business on any day vs. happy employees who voluntarily become your brand ambassadors and your marketing agents. The value that satisfied employees can add to your business is immeasurable and that can only be secured through forging the right type of relationships from the moment you source and hire talent and during all the steps you take beyond that. 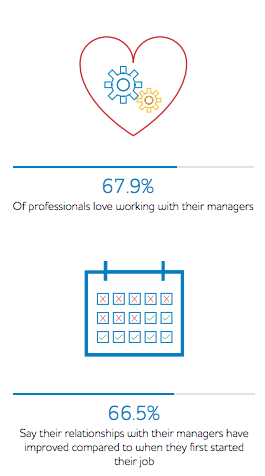 93.6% of professionals who responded to the Bayt.com poll Relationships between Employees and Managers in the Middle East said that they care about having a productive and professional relationship with their managers. For 90% of professionals who responded to the Bayt.com poll Teams in the MENA Workplace, teams, and the relationships they form within them, are a very important part of their satisfaction at work. So relationships at work are not merely a matter of compatible personalities and common interests. Relationships are at the core of productivity and success for any business or organization. The more care and attention that is given to any type of relationship that impacts work, the more likely it is to yield positive results for the entire team and company. So, why might relationships be neglected? Here’s a look at a few potential reasons. The issue that often arises when we talk about relationships at work is crossing the boundaries. The line can get a little blurry between what constitutes a professional aspect and what constitutes a personal aspect of a relationship. For instance, does a healthy and productive employer-employee relationship mean socializing after work? Does it mean treating each other as friends? Or does it simply mean having a respectful and workoriented relationship? These are all possible variations of workplace relationships and they are all, in fact, positive. The unwanted type of relationship is one that is “unproductive and/or unprofessional.” The good news is only 2.9% of professionals in the MENA region used such negative words to describe their current relationships with managers. In other words, a healthy and productive relationship isn’t necessarily one that is casual and socially demanding. One can still maintain positive relationships at work based on mutual respect, communication, honesty, and understanding, even if the relationship does not at all exceed work-related matters and discussions. Another reason why relationships may be neglected at work is the fact that they are often treated as an isolated HR function. Yes, the HR team at any company is in charge of human development and many key functions such as: sourcing and attracting talent, hiring and onboarding, training and professional development, succession and retention planning, and numerous activities that cater to the employee’s productivity and well-being at the workplace. However, building productive relationships is much more involved than that. In fact, management plays the bigger role in this area. 82.1% of respondents to the Bayt.com poll Relationships between Employees and Managers in the Middle East say that their relationship with their managers affects their happiness at work. This is something that the HR department cannot really control on its own. A manager who communicates often, treats his/her employees with respect and integrity, involves the entire team in brainstorming and planning, provides feedback, requests training when needed, and shows genuine care towards employee satisfaction and well-being will have a much more effective attempt at creating long-lasting productive relationships at work. We can think of HR as the facilitator of relationship and team strengthening activities. However, this is a process that ideally involves every individual manager and employee in order to be truly fruitful. Another issue that might arise when considering relationships at work is how to measure their impact. Sure, we hear many stories and examples of team-building activities and the resulting improvements in employee turnover and satisfaction rates. However, businesses that need to understand the impact of each relationship and team-strengthening activity on the bottom line may find it challenging to accurately measure that. At the end of the day, linear cause and effect measurements aren’t always feasible. Healthy relationships may have an impact on numerous aspects that are essential to the success of the business including satisfaction, productivity, efficiency, loyalty, ethical behavior, etc. A satisfied and healthy team is in itself an accomplishment that companies can certainly brag about. But how exactly do you go about building better relationships at work? Here’s a primer. 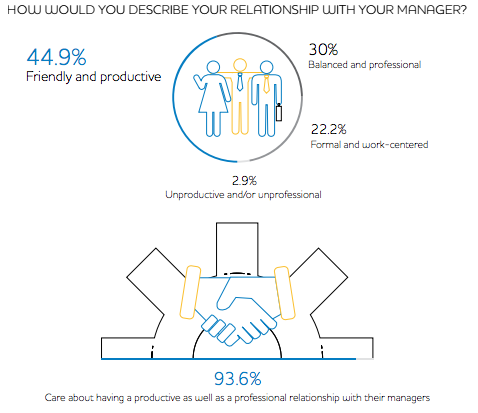 When asked about the behavior that is most damaging for relationships at work, the majority of respondents to the Bayt.com poll Relationships between Employees and Managers in the Middle East cited “lack of respect.” Employees need to feel valued and admired as individuals as well as contributors to the overall success of the company. No matter what their position is or where they fall in the career hierarchy, there is never a good reason to disrespect or disdain an employee. Similarly, if an employee has some shortcomings or fails to accomplish their tasks, then criticism should also be delivered in a way that safeguards the employee’s integrity and self-worth. Avoid thinking of your employees using a top-down approach. Opt instead for a peer-to-peer management approach. At Bayt.com, for example, the organizational structure is very flat and void of any excessive hierarchy. Any employee, regardless of position or career level, can walk into the CEO’s office and talk about any matter or concern. This leads to a smoother workflow, an effective communication process, and healthier professional relationships. All successful relationships, regardless of context, revolve around effective listening and paying attention to each others’ needs and priorities. More than a third of professionals in the Middle East (38.6%), as seen in the Bayt.com poll Relationships between Employees and Managers in the Middle East, agree that adopting an open communication policy is the most important step that managers should take to improve their relationships with employees. Listening can be a byproduct of open communication. Managers should adopt an open door policy, welcome feedback and input from their employees, truly pay attention to employees’ changing needs and goals, and constantly keep their teams abreast of new occurrences and events taking place in their department and company. Lack of trust from management is also one of the most damaging factors when it comes to employer-employee relationships. When employees aren’t trusted, they won’t be able to contribute at their full potential, as they are limited in how much they can achieve. Additionally, a distrusted employee will feel disempowered and is very unlikely to be satisfied and loyal to the company. Encourage initiative and participation. A healthy employee-manager relationship leaves room for contribution and creativity, and leverages an employee’s self-confidence and passion to grow. Listen to what employees have to say, take their opinions into consideration, allow them to try (and fail if they need to) before they score big. Macro-manage them if the nature of their job allows you to, and empower them just enough to take decisions that are directly related to their job responsibilities. It goes without saying that praising a job well done is of utmost importance whether an employee is working individually or as part of a team. A manager who is looked up to is a manager who appreciates and praises employees when needed. A thank you letter, a moment of appreciation during a team meeting, or even a small gift can go a long way in improving relationships but also increasing employee morale and motivation. Keep in mind that at the end of the day, like any other relationship, a healthy employer-employee relationship is based on give and take, and mutual appreciation and respect. To take things a step further, do make an effort to create a comfortable and enjoyable environment for your employees. Try to eliminate any unnecessary stress for your employees, be accommodative of their needs, celebrate their life achievements and milestones (i.e. birthdays, engagements, etc. ), and help them achieve work-life balance. Managers who create and foster a balanced and healthy work environment can easily utilize it to strengthen the workplace relationships with their subordinates as well as among peers and different teams.